At Denver International Airport (DEN), there’s now a place to rental strollers, car seats and other kid-stuff you might need for your time in the city. 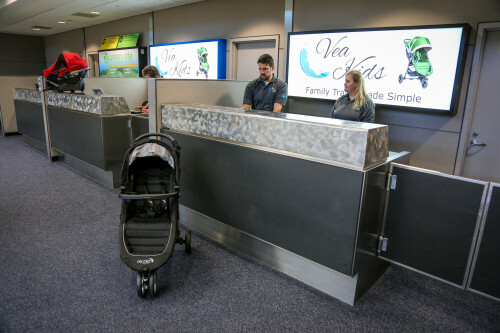 Vea Kids, in the Jeppesen Terminal near passenger arrivals in the center of the Great Hall, not only rents strollers, kid-carrier backpacks and kid tents, they rent “pack n’ play” sets and sell diapers, pacifiers, bottles, organic snacks, wipes and other kid products. You can order the gear online and the company offers free pick-up and drop-off in the baggage claim area. Here’s a link to a price list. Hours: 7 a.m. to 9 p.m. Sunday through Friday, and from 7 a.m. to 7 p.m. on Saturdays.